The HSGI Shot Shell Tray V2 is a shotgun carrying pouch designed to store (10) 12 gauge shotgun rounds. 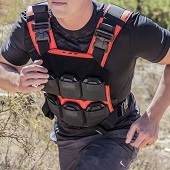 This tray can then be attached directly to any soft Velcro surface, Velcro side saddle, or inside of an HSGI Taco® or similarly sized magazine pouch (such as an M4 magazine pouch). The new HSGI Shot Shell Tray design consists of two - Velcro hook backed rubberized nylon web platforms with five shell slots. An additional MOLLE platform is included.